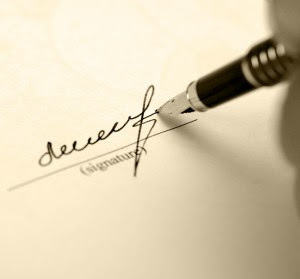 If you have a blog, you may be wondering how to add your signature after every post on your Blogger or Blogspot blog. This feauture will add more professional look to your each post and make it look beautiful.You must first have a signature that you want to have at the bottom of your post. MyLiveSignature, a free graphic signature making service that helps you to “make a signature” from 120 different fonts. The Plugin then uses the HTML code MyLiveSignature provides to feature your new graphic signature on your blog. You can add that to your blogger, or take advantage of the LiveSig WordPress Plugin to add it automatically. 1> Create a signature using MyLiveSignature or any other website. 2) Copy the Image URL. 1. Go to your Blogger Dashboard and click on Layout then Edit HTML. 2. Check the Expand Widget Templates box. 3. Click CTRL-F and copy and paste the line below in the search box to search for it in your code. Or something similar- either is fine. Just look for that line. 4. Under that line, paste this code and change IMAGE URL to the url address of your signature image (it’s the Direct Link on Photobucket). 5. Preview it and Save it! You’re done! The idea of adding a signature to every blog post sounds really cool. I am grateful to you for posting the complete process to perform this operation. Thanks friend for this wonderful tutorial. Hi,This one is great and is really a good post. I think it will help me a lot in the related stuff and is very much useful for me. Very well written I appreciate & must say good job. I was so happy to see my most loved bloggers back to posting this week. Don't hesitate to share some you could http://awriter.org/ultiuscom/ call your own most loved like in the post. Two full thumbs up for this magnificent article of yours. I've really enjoyed reading this article today and I think this might be one of the best article that I've read yet.